I'd just like to update you on Katy Dunne's progress and future with us here at Halton and the Everyball International Academy. As you may know, Katy has been with us now for the best part of 5 years. During that time we have helped her to a U14 Tennis Europe ranking of 8 and two years later she is now on the verge of breaking into the Top 100 in the World (18&U Junior ITF World rankings). She has been given wild-cards into the Main Draw of the Wimbledon Junior Championships these last two years and she is determined to qualify by right next year with the goal of breaking into the Top 50 and beyond. During the last year we have encouraged Katy to develop her relationship with the LTA's Jane O'Donaghue who has been traveling extensively with Katy around the world. Jane is part of the team of National Coaches based at the LTA and Katy has been spending some time accessing hitting and training opportunities there in addition to her work with us. We feel that the time is now right for Katy to move to the National Tennis Centre on a full-time basis and have encouraged her to pursue that goal. Following her exit from Wimbledon on Monday we have had several very positive meetings with the LTA and I am pleased to announce that Katy will be training under Jane's full-time guidance at the NTC with immediate effect. I say 'pleased' with mixed emotions of course. We believe whole-heartedly that this is the right move for Katy, but with the ending of any relationship such as this there will be some sadness. She has been a delight to have with us and has had a very positive impact on the Academy and club as a whole. The LTA will be building in her TEAM AEGON contract an ambassadorial role with us here at Halton whereby she will continue to be involved with us over the next years to help support and encourage all the work going on with our younger players and of course with the membership as a whole. She will continue on as a member and will be down for the occasional club session with us and perhaps to play the odd match or two - in that sense we will continue to be her 'home' club. It is important to recognise at this stage that this will in no way effect our LTA High Performance Status now or in the future. Our accreditation as an HPC is built around the strength of our player base across all ages as well as our strength and conditioning staff, coaching staff, competitive offerings and financial management capability. A big thanks to all of you who have been so closely involved in supporting Katy over these years - to single anyone out would be misleading as so many people have played their part in demonstrating that we have at Halton the expertise to help develop a player from a national top ranked 12&U junior into a true world class contender. All of us here at the club would like to wish Katy all the very bestin her future goal of becoming a top professional. 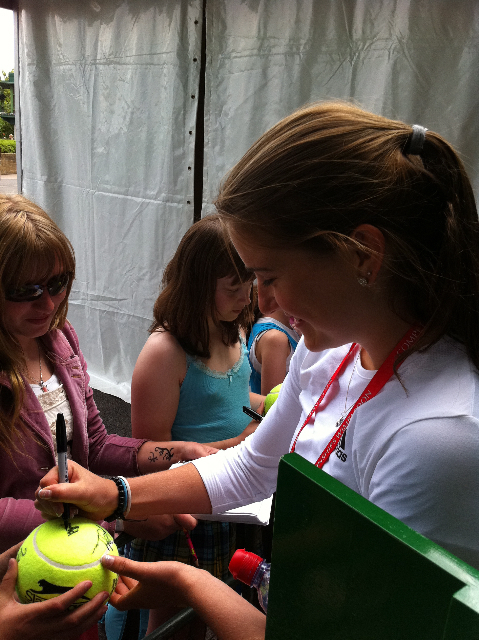 Perhaps soon enough she'll be signing autographs as a competitor in the Main Draw Ladies event at Wimbledon! She's pictures below at Wimbledon last week with some enthusiastic youngsters.